Those who know me cannot but help being aware that I make pots. 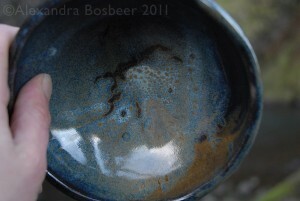 Whenever I can and by hand, with slow processes and simple clays. For the past four months, I have been practising making pots on the wheel, in the hope of inching closer to a skilled level, and trying out different clays. I have been deep in the wonders of what one can do with a bit of milled mud and some basic tools. Myself, I love the casual unevenness of a handmade object – so much better than the mold-made porcelain mugs with a decal of ‘Bonn!’ stuck to it. The handmade is unique; the molded, smoothed piece is no different from millions of others cluttering tea-stained cupboards of workplace kitchens all over Europe. 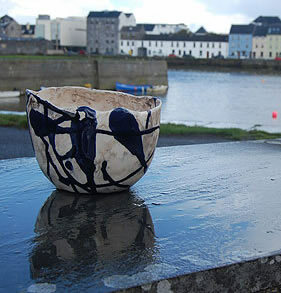 The handmade has a handprint – literally – in fact, the Victoria and Albert Museum in the UK has lifted the finger print from indentations on a Neolithic bowl made about 5000 years ago – and they are thinking of using this to work out what other bowls the same potter made. This finger of a potter 5000 years ago had a long nail, used as a decorating tool – perhaps this was even a social sign of a potter. 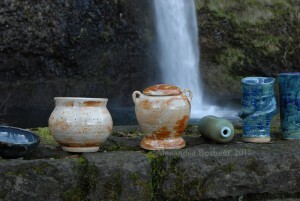 Could it be that potters were recognized as alchemists who transformed earth into watertight cooking vessels? Or perhaps they simply performed this miracle regularly without the weight of adoration, their function no less special than the farmers who produced food from earth and the weavers who used the tiny flax plant to produce sheets of linen for clothes. I recently gave away the pots I made while learning: some successes, some failures to predict glaze interaction, some all right until you try to lift them and discover they can act as book ends. Supposedly, a true artist should break the pots one doesn’t want ‘discovered’ later – I suppose the true artist pretends to have sprung fully skilled from the head of a throwing wheel, making gloriously light and shapely forms, and inherently knowing the interactions of glazes and heat. Me, well, I was told that there are many people here in the US who can afford no Christmas gift at all for anyone and that the pots, even the imperfect ones, were welcome. Today, I was told that the people at the food charity were unsure that they were actually being given the pots. These were people who had come to a food bank for emergency food, and yet the imperfect bowls seemed more than a possible donation. Of course it’s gratifying to think that people enjoy and will use the pots that were made in my quest to make better pots. But it’s horrifying to think there are people to whom the slightly misshapen pots, the ones a proper artist would have taken a hammer to so she could pretend the skills came one day to her fingers by magic, are more than they expect to receive from a stranger. People who depend on emergency food. People who don’t have spare cash for a small present. Maybe the elderly woman who begs outside a downtown supermarket, tottering on her walker. And the same people who smile sweetly at me when I stop for a stoplight near them, in a warm car, knowing it is cold outside. One Response to "Making and donating pottery"
I really enjoyed to visit your post. I have read your post and got a good helping information about Handmade Pottery. Thanks for sharing.